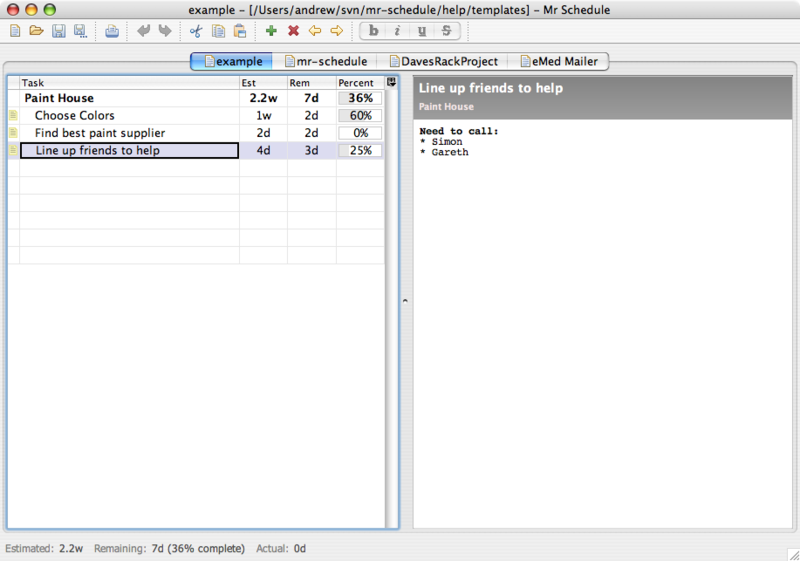 Mr Schedule is a powerful and intuitive tool for creating and managing software schedules. The sophisticated outlining capabilities make it trivial to orgainise and to break your tasks down into components. The tool supports milstone tasks and integrates a rich text editor for keeping notes. You can export to CSV and the text based file format keeps you safe from vendor lock in. Runs on Windows, Mac OS X and Linux, or any Java 5 based system. - Integrated text editor allows you to keep detailed notes with any task. - Export your task list to CSV and import into MS Excel. - Simple text based file format (zipped XML) so you're not locked in. 'Schedule It' is the ultimate in room, people and resource planning software. Appointment scheduler for people, places & things. Flexible schedules. Powerful employee scheduling software. Weekly and Break schedules in minutes. Qweas is providing links to Mr Schedule 1.0.98 as a courtesy, and makes no representations regarding Mr Schedule or any other applications or any information related thereto. Any questions, complaints or claims regarding this application Mr Schedule 1.0.98 must be directed to the appropriate software vendor. You may click the publisher link of Mr Schedule on the top of this page to get more details about the vendor.